We have some big news to share! EZR’s renovation of the Idlewild House in Midtown Memphis has been named a 2016 Building Memphis Awards finalist in the “Best Conversion/Renovation Project (Less Than $5 Million)” category. Our entire team is thrilled by this honor. Presented by the Memphis Business Journal, the Building Memphis Awards honor commercial real estate projects that have created a positive community impact in the areas of investment, new jobs, environmental leadership, renovation or revitalization. It all started with our long-time client and partner, Bennett Rudorfer, who purchased the property, entrusting us to conceive and carry out the vision for this project. Suntrust Bank provided the financing for the project. When we encountered some zoning challenges, Solomito Land Planning came to the rescue, ultimately securing this property a single family home provision on the PUD. As they have so many times in the past, our trusted contractor, HCCI Construction, worked incredibly hard to bring this project to life with the highest quality, the ability to solve any problem, and all-important attention to detail. For EZR Management’s part, we designed and helped execute the renovation using our knowledge of the area, the rental market, and an eye toward the future. I acted as the lead project manager and my staff began to joke that I lived at the Idlewild House! Seeing the transformation from start to finish was rewarding — and managing the property as a rental home at the very top of the market has been the cherry on top. The Idlewild House project was an effort to transform a historic Midtown home, built in 1901, previously occupied by Garbo’s Women’s Consignment Store into a luxury rental property. We applied our unique philosophy regarding property renovation and management to ensure everything about the home was suited to the Millennial Midtown dweller. We converted the property from 1.5 bathrooms to 2.5 bathrooms (more appropriate for a large, four-bedroom house), adding a luxurious, modern bathroom with dual sinks, jacuzzi soaking tubs, subway tile walls, and basket weave flooring. When the property was used as a retail space, there was no kitchen, so we built one from scratch. We moved a wall to create a huge eat-in space with granite countertops and lots of cabinet space. Stainless steel appliances added a modern element to the kitchen. We reduced energy usage and costs with high-efficiency HVAC, LED lighting, brand new electrical, and more. Ultimately, this renovation created a beautiful and unique rental property—with both a historic feel and modern, high-end features. It’s also a property that helps contribute to the amazing resurgence going on in Midtown Memphis right now. It’s not uncommon to see several renovation projects while passing through Midtown, and there’s a newly “flipped’ historic property available to rent every day. What makes the Idlewild House unique is the caliber of the renovation. We’re proud that down to the last detail, this home caters to individuals looking for a more high-end rental option. Along with some other properties EZR Management has renovated (like this one near Overton Square), we have been on the leading edge of the revitalization in Midtown. 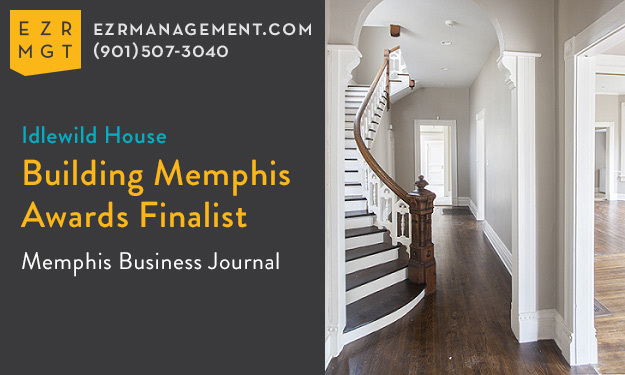 We’re incredibly proud of our work on the Idlewild House renovation, and we’re very honored and thankful the property has been recognized by Memphis Business Journal as a Building Memphis Award finalist. Along with the great team of people we worked with on this project, I also want to thank all the fantastic clients and partners we’ve worked with during the past nine years. It’s because of you that EZR continues to grow and we have the opportunity to do what we love every day. 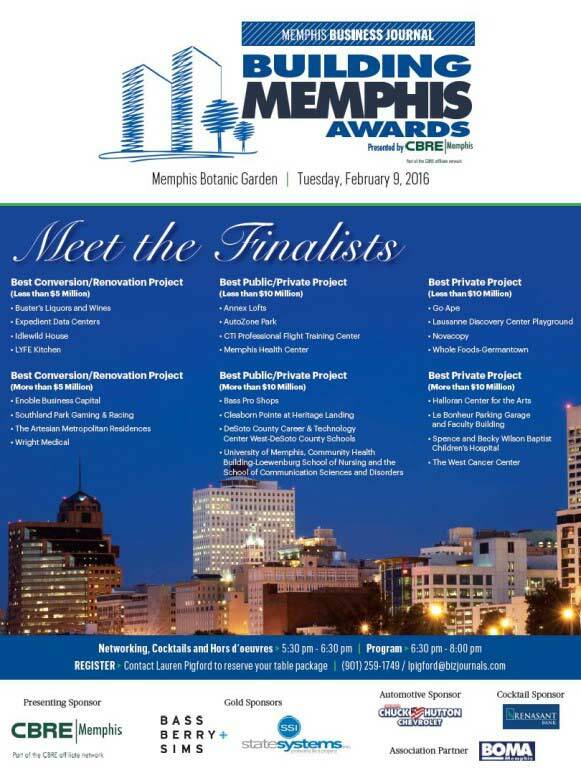 The Building Memphis Award winners will be announced at a ceremony at the Memphis Botanic Garden on February 9. Stay tuned to see if we take home the top prize! Learn more about this Midtown Memphis renovation project and see more photos.